Totem Signage Board capable enough to captivate the glance of the general public.It is the perfect messengers of the new products and services that have been introduced in your business. Our Company is one of the reputed names in the market for offering a wide assortment of Totem Sign Board at very affordable rates with the support of professionals. Totem or pylon board done for a reputed salem school. 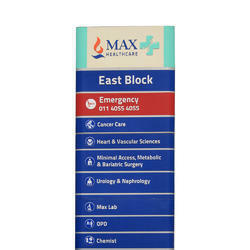 Totem Sign offered provides for eye catching features to the brand or organization name. These signs are appreciated due to its attractive looks and high performance and come in excellent color quality as well as in high definition graphics. These are designed for low electricity consumption and provide high visual clearance. 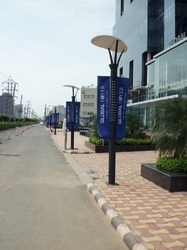 We are a leading manufacturer of Totem Pole in Delhi - NCR . We offer our products under the brand name" Promote India". We are an accomplished organization which has gained name and fame in providing Totem Board to the customers. Height – 1 to 10 meters. We are most renowned name in the market proffering world class collection of Totem Poles. They are available in many specifications. Our firm specializes in offering an excellent range of Totem Pole Signage. we are leading manufacturer of Totem Pole in Delhi NCR. Totems with side lighting. Is a new age totem sign. The sophisticated look and attreactive design will boost the show of any showroom, factory or anything.